With every aspect of our lives getting computerized the future of eCommerce is very bright. It has grown tremendously, progressed from desktop users to laptop users and now mobile users. eCommerce is where the excitement is today. However, brick and mortar stores are still getting a major share of the business. Therefore, a combination of online and offline stores is where the future lies. A balance between the two will go a long way. Retailers have to be on their toes to be successful and have a worthwhile profit margin because there is a lot of competition not only from brick and mortar stores but even online stores. The global online retail sales figure is expected to reach 17.5 % in 2021. B2B sales will increase by 2020 globally to $6.6 trillion. Amongst all the online activities online shopping is the most popular. Digital development is taking place in leaps and bounds, therefore eCommerce development services are growing. Being tech-savvy today is very important. Online retail shops are very popular, especially amongst youngsters. Therefore, brick and mortar stores need to have a digital presence also. However, there is also the need for physical stores as people need to touch, feel and try what they are shopping for. Therefore companies like Amazon are coming up with brick and mortar stores so that they can be associated with the complete shopping experience. The youth is where the future of online shopping is and the youth spend a lot of time on social media. So, combining social media and online shopping is a concept that is growing popular. In fact, a lot of youngsters already look for products that appeal to them on social media and get feedback from their online circle so that they know what they are going in for. This is called ‘Social Commerce’ and is among the most important in eCommerce future trends. Shopping can be done via multiple channels like if you see a pair of shoes that your friend is wearing on Instagram then you will ask your friend where she got it from. After which you will get onto that website and buy it. Not restricting shopping to one channel is very beneficial for business. Online shopping, when done on mobiles, is called Mobile Commerce. This is also an upcoming trend in eCommerce future. This is because of smartphones being used a lot in developing countries. This increases the scope of the global market when it comes to eCommerce. However, it is important for the eCommerce sites to simplify the process of buying for the consumer and make the sites mobile-friendly so that they have a good shopping experience, not a cumbersome one. The Internet is slow in developing countries however it is not on mobiles. So, mobile apps can be downloaded and used easily. It is very important to automate operations for the growth of eCommerce as the retailers have to have real-time information regarding available stock, shipping of orders along with knowledge of approximate transit time, and various modes of payment should be made available to the customer for his/her convenience. The business will have to automate stock management, processing of orders, invoice and billing, handling of delivery, returns, and refunds. This is important as, if orders are not processed in time, if they are not in stock, this will work against the retailer. Customer experience will not be good and if orders are canceled or delivery is delayed then customers will get onto other sites and not be loyal. Besides, word of mouth publicity will be negative and will have an adverse effect on the retailer’s reputation. Gone are the days when online shopping was done on desktops. Now even at home, mobiles are used for online shopping. It is not necessary that people use mobiles only when they are on the go. Shopify is a good option to run your store because audiences like it, it works on all devices, and on a desktop, you will be able to see exactly how the design that you choose for your store will look to the mobile audience. China, India, Brazil, Russia, and South Africa are the emerging markets and will lead to eCommerce growth. This is because the population of these countries will have access to the Internet which will lead to a lot of potential customers. All these will be new markets to explore therefore will be new audiences to reach out to. These nations show the promise of giving a good, lucrative business in the future. For example, a top online retailer like Nike has two new physical stores in Shanghai and New York that offer services like customizing products yourself, exclusive products, participation in fitness tests, trying out new products by playing games with them, enrolling a personal shopper, etc. Shopify gives great customer experience to current and aspiring businessmen. They have opened a new physical store in LA. These kinds of experiences cannot be given online, therefore a combination of brick and mortar store along with an online store will give the best experience to the shopper. Videos play a great role in the future of eCommerce because research shows that 60% of online shoppers prefer to watch product videos rather than read product descriptions. Research also shows that 64% of online shoppers buy products after watching product videos. Therefore, to include product videos on your website is a good marketing strategy. People like attention and need to feel that there is someone who cares behind the scene. eCommerce sales will go up if you can add a touch of personalization. You can do this by addressing the customer by name when you send them e-mails, you can give them a sneak preview on your product launches and give them bonus points on what they have bought from your site, you can ask customers to give feedback on what they have bought. Overall customer shopping experience can be enhanced by chatbots, artificial intelligence. Artificial Intelligence Assistants can give you time to pay attention to important aspects so that your business runs well. They can take tasks like stock taking, handling inquiries, etc. Chatbots can handle complaints and answer questions regarding a product. B2B is growing in leaps and bounds. However, personalization is also required in B2B eCommerce. Research done shows that 50% preferred personalization when looking for suppliers online with whom they could build good relationships. All shopaholics have the need to get what they see. This can be made possible when an online shopper can interact with the product. Technology today gives access to 3D imaging, virtual reality, augmented reality, and some more. Product videos have evolved therefore online shoppers have the luxury of shopping from the comfort of their homes and their hesitation to buy products online has decreased. Sometimes people see a product online and pick it up in a store. They do their research regarding the product online and then go to a physical store to buy it. They use multiple channels to shop. It has been found that the more channels shopper’s use the higher is the possibility of them buying the product. So, give your customers the information and facility of seeing the product online and buying it from a store near them. Many people are buying stuff from outside their country. In fact, research shows that 57% of shoppers who buy online have bought something from outside their country in the last 6 months. Therefore infrastructures and technologies should be in place for you to be able to send across products overseas. The growth of eCommerce in this area i.e. going global requires you to strengthen your global presence. It is about using voice technology to make a transaction online. This has become very popular and statistics show that by 2020, business will be $40 million in sales in the U.S. only due to, voice commerce. Should be introduced for eCommerce sales to take place comfortably. It will help you to compete and be one up. Google Pay, Apple or Samsung Pay, Paypal are some of the digital wallets you should introduce for your eCommerce business. Cryptocurrency has also been introduced, however, until now it is being used mostly for big business transactions. eCommerce is growing. In spite of ups and downs, the eCommerce market is growing at a pace which is exciting but also scary. Every year new changes and challenges have to be met. However, the future of eCommerce is bright and growing brighter by the minute. For a bright eCommerce future, you need to work with data companies, social media platforms, and technology to make sure that customer information is safe. To improve the shopping experience and make your shop online more popular and known, the concept of pop-up shops is coming in. Pop-up shops are temporary shops that are put up. They can be there for 1 day, 1 week or 3 months. You combine this with your website and sales pick up. You can sell products and give the shoppers a very pleasing time in your shop so that your reputation picks up. After the pop-up shop has been shut down, the pleasing experience will still be there in the buyer’s mind and that will help. The purchasing power of Global shoppers has become greater, there is an increasing number of social media users, the continuous progress of infrastructure and technology will ensure that the future of eCommerce will reach great heights. Also, less data being leaked on eCommerce platforms helps customers feel secure and trust them. Customers share their personal information quite easily. It can be said that eCommerce is here to stay. It is going to be the future of convenience. Giving Shopaholics a good shopping experience will benefit the business tremendously as eCommerce is on the rise. Going digital is the need of the hour. The world is changing from brick and mortar store shopping to a convenient and fun way of shopping. Social media has brought about a big change. This change has influenced eCommerce in a big way. 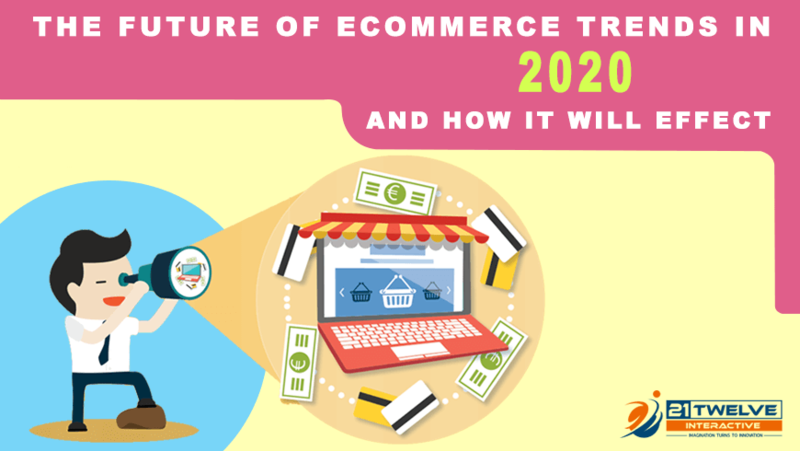 It has been predicted that the future of eCommerce in 2020 is that it will be seamless, easier, more convenient and powerful. So, enjoy shopping in the ever-changing world.